Caramelised pork hock with tamarind caramel sauce served with cos lettuce, fragrant herbs, pickled carrot and papaya. 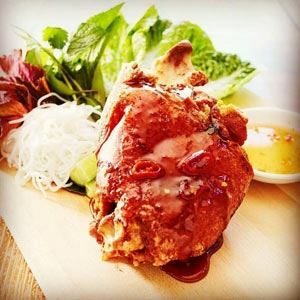 Experience an explosion of exotic flavours at Hanoi Mee Kitchen & Bar on Rouse Street in Port Melbourne. Step through the doors onto the streets of Vietnam, with booth seating and picturesque wall murals setting the vibe for a memorable Asian fusion dining experience, while worn brick and a bright neon sign add to a happily buzzing ambiance. Embark on a tastebud tingling journey with Petuna cold smoked trout rice paper rolls and steamed prawn dumplings, before dipping a spoon into an authentic Sher Wagyu beef pho with brisket and raw sirloin. Delicious dishes like crispy whole baby snapper with ginger dressing, lettuce and noodles await hearty appetites, along with twice cooked beef short ribs and green papaya salad. For something sweet, be tempted by Australian honey pana cotta. On behalf of Executive Chef and Director Ennis Le, we trust you will enjoy the menu and flavours created for your dining experience. Ennis has created a combination of dishes that best represent Vietnam from North to South and he has created dishes using only the finest of herbs, spices, technique & freshest of produce purchased daily, with lots of love put into every dish for your eating enjoyment. Ennis has created a name for himself and gained a reputation for his attention to detail and presentation, along with his flare and creativity. Having started his passion for cooking in his motherland of Vietnam and learning from his mother at an early age, his destiny was sealed. Ennis migrated to Australia in 2009 where he further established his experiences and gained formal qualifications & recognition. Before long Ennis was the Head Chef at Dandelion in Elwood and making a name for himself, earning awards for the Age Good Food Guide, and a Chef Hat, Gault & Millau, Savour awards, etc... is all a part of a day's work he says. On Behalf of the Team Malcolm Bond, Ennis Le, we really hope you enjoy and leave us happy and full. And of course we want to see you all come back soon. Please note: we only take phone bookings. Great vibe! Yummy food, great cocktails and drink selections. Will defiantly be going back! It was my birthday so I went with 3 friends and asked the chef to prepare what he recommended. We had 4 entrees, 2 were prawn, a beef rice paper roll, that melted in our mouths and a dim sum. Main course and we received a crispy skin fish that again melted in our mouths, the most delectable caramelised pork hock complete with crackling and a delicately flavored chicken curry. Dessert then followed where we were able to share a chocolate lava cake, local Vietnamese dessert and a creme caramel that was perfectly balanced. I am going back again next week to start working my way through the menu.